I am brand new to Stack Exchange. I think I am being particularly thick & dense.. I just can’t work out how to ‘Apply a Tag’ to my question on The English Language & Usage Site? I did (somehow!) manage it yesterday, my first post & question; however can’t for-the-life-of me, remember how I did it & can’t seem to replicate it today! I have gone into the ‘help page’ and ‘’advanced help’ on Tags but STILL can’t ‘get it’! As well as taking ‘The Tour’ several times! Could you please, give me detailed and clear instructions how I can submit a tag to a further/additional question please? When responding please note; I am severely dyslexic (think this is also the problem why I can’t fathom-out how to place a tag into a question) Therefore please make your explanation as clear and precise & detailed as possible. Once I’ve ‘got it’; I won’t need to EVER ask again. Sorry to be a nuisance and pest. I am able to use ‘the Tags’ on Meta; as I just simply ‘click’ on the blank space (in Tags) and I am given several options; in this particular instance, I chose ‘support’!! However I am unable to do this on the main Stack Exchange site! Maybe Stack Exchange, is just too advanced a site for me? Hope not! So, tags are the bottom-most text field which appears when you ask or edit a question. It is this field, outlined in red in the screenshot below, which you need to populate to properly tag your question. The user experience for this field can be a little confusing; it looks like a standard text input just like the title field, but when you start using it, it acts differently. To use it, start typing the name of the tag you want (e.g. word-choice or grammar), and below the field a list of tag suggestions will appear. Notice in the screenshot I've already included the badge "word choice", and then started typing gr, and the prompt below has dutifully suggested all tags containing that sequence of letters ("grammar", "grammaticality", "orthography", etc). 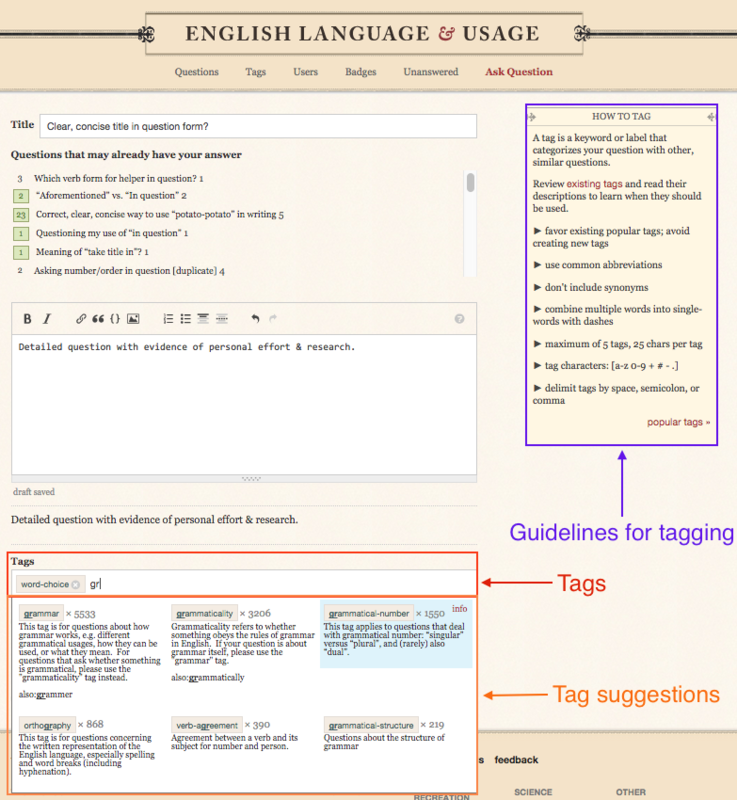 You can click on one of the suggested tags to add it to your question, or simply finish typing the name of the tag. It's really best practice to re-use an existing tag than create your own (see guidelines for tagging outlined in purple). You may click on any of those links to learn more about that specific tag, including the kind of questions it's usually applied to, or see a longer and more detailed list of the most popular tags on EL&U (accessible by clicking the tag tab at the top of the list of questions). In re: how to know if/when someone has responded to you: most people simply check back periodically or keep the site open in a background tab. If someone has answered your question, addressed you in a comment, or voted on one of your posts, the black header bar at the top of the page will contain a notification (a red numeral, like an iOS badge, over the "inbox" icon for answers and comments; or a green highlight to the histogram icon for votes and other notifications relevant to your reputation). Alternatively, if you have a mobile device, you can install the native app, and get push notifications and badges (similar to how you're notified of emails and txt messages). I can't submit question. How can I send it?